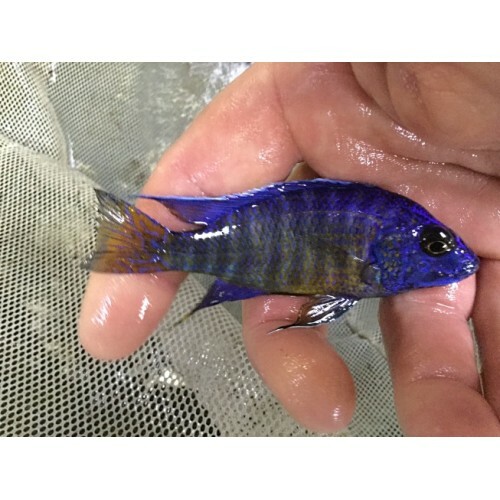 Aulonocara stuartgranti Madoka (Flame Tail) is the least common of the flame tail peacocks in the hobby. The male face is blue. Most show yellow or yellow-orange on the body. The tail has yellow or occasionally orange with blue. This fish is a close variant of Ngara Flametail (Yellow) from a different location. The photo is a young male from my wholesaler. Mdoka flame tail tends to show color at a younger age than Ngara. 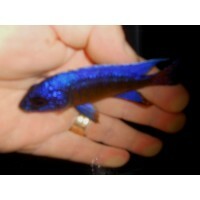 Occasionally available on a special order list and may be brought in in limited amounts in 3" or larger males as well.